This small Charm Size Miraculous Medal available from CatholicShop.com features dimensions of 12 X 8 millimeters, approximately 1/2-inch by 3/8-inch. The petite size makes it ideal for women who prefer small medals, and children as well. Solid 14K gold. 1 3/8 x 1-inch Sterling Silver 4-Way Medal on a 24" rhodium plated heavy curb chain. This Childs Crucifix Pendant measures 14 X 9 millimeters, approximately 1/2-inch by 3/8-inch. Made of 14K Yellow Gold, this piece features a weight of 0.26 grams. It comes ready for gift-giving in a complimentary jewelry box. SALE! This 14K gold Miraculous Medal available from CatholicShop.com features dimensions of 25 X 17.5 millimeters, approximately 1 inch by 3/4 inch. The standard size makes it ideal for women, and for men it would be considered a smaller or medium-sized medal. 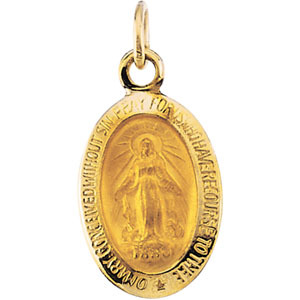 Made of 14K Yellow Gold, the standard sized Miraculous Medal shown here weighs approximately 2.33 grams. The core of the medal is hollow, making it an affordable but still very durable choice for a 14K medal. It comes ready to give as a gift in a free deluxe gift box. This 14K Yellow Gold Small Miraculous Medal has passed our quality control assessment and meets our strict criteria to be a Catholic Shop product. Buy with confidence. Catholic Shop aims to carry the finest products on the market. Our staff has inspected and tested this 14K Yellow Gold Small Miraculous Medal and found it to be worthy of our Satisfaction Guarantee.